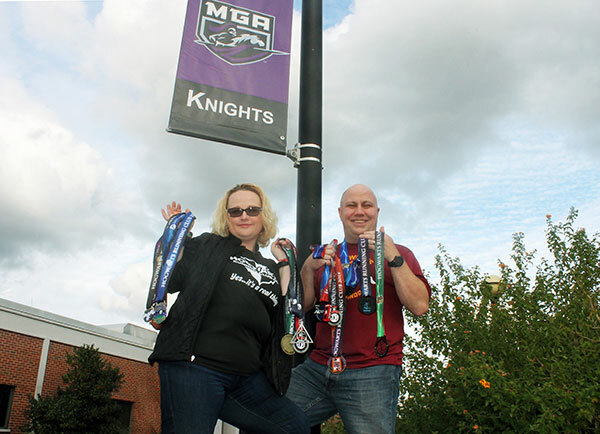 Photo: Dawn and Brian Biggs show off some of the medals Hogwarts Running Club members receive for completing virtual racing events. It began as a way to raise a little money for charity and connect online with other Harry Potter superfans. Now, the virtual Hogwarts Running Club (HRC) is putting $400,000 and counting into the coffers of various charities and is about to launch a full-time career for Middle Georgia State University senior Dawn Biggs. Hogwarts Running Club is a Facebook community of more than 23,000 members. The club coordinates “virtual runs” with Harry Potter themes, such as Sorcerer’s Stone 5K, Department of Mysteries 6.2442, Voldemort V-Miler and Dementor's Kiss 5K. Runners (or walkers) pay $25 each to register for the events, then complete the miles on their own time and at any location. Self-reported finishers (all on the honor system) are mailed beautifully crafted Wizarding World-themed medals. After covering costs of having the medals manufactured and mailed, Dawn, 41, and her running club partner (who is also her husband), full-time Air Force Reserve Lt. Col. Brian Biggs, 40, donate remaining proceeds to various charities nominated by HRC members. To maintain transparency and assure runners that funds are indeed going to charities, Brian and Dawn make in-person check presentations to the receiving organizations, which have included The Jimmy Fund, Dana-Farber Cancer Institute, Miles for Cystic Fibrosis, Dogs on Deployment and Achilles International. Running club members have a standing invitation to contact the charities directly to verify donations. Brian – who is stationed at Robins Air Force Base and lives with Dawn and their daughter, 9-year-old Rory, in Warner Robins – had heard of a Star Wars-themed virtual running club. He began to ponder what theme he would use if he created his own virtual running club and quickly settled on his favorite book/film series – Harry Potter. Dawn, who enrolled at Middle Georgia State after the family moved to Warner Robins in 2013, joined her husband in managing HRC, eventually becoming executive director. The first virtual race that HRC organized, the Sorcerer’s Stone 5K, drew 32 participants. The registration fees collected were just enough to cover the cost of making and mailing finisher’s medals. In the first few months, membership (all it takes to become a member is to “like” the club’s Facebook page) gradually increased to several thousand and the amount raised for charities crept up as well. But once an HRC member who also happens to be a writer for MuggleNet, a Harry Potter fan site, published a story about the club, things began moving faster than a Quidditch match. Runner’s World magazine picked up on the MuggleNet story and published its own version. Within a week, HRC membership doubled and kept climbing. Members come from all 50 states and at least 30 nations. The club is having a significant impact on the charities it supports. Last year’s entire budget for Brotherhood Ride, a Florida-based group of firefighters, police officers and EMTs who ride bicycles to honor those who have died in the line of duty, was about $30,000, according to Brian. For 2015, HRC is donating double that amount to the organization. HRC’s growth has been such that it now has a five-member board of directors. Dawn plans to become full-time executive director after she graduates from Middle Georgia State. She and her husband have applied to the IRS to get 501(c)(3) status for the club. All charities that HRC supports must be nominated by club members and have 501 (c)(3) status. Dawn and Brian said they take care to knowingly stay within the lines of legality. What Dawn and Brian find especially satisfying about Hogwarts Running Club, besides the funds raised for charities, is the enchanted online community they’ve created. There are members who said the club inspired them to get off the sofa and start running or walking. Many have reported losing weight and getting healthier. Ultra-marathoners are mentoring beginning runners. Various members volunteered to create the club’s website and contribute graphic designs. People in Ohio who met through the club are planning to get together in person for a Christmas party this year.